The Candle of Love that inspires you to enjoy the people in your life. After you light this candle and enjoy the scent it emits, you will find yourself relaxing . . . tiredness and fatigue seem to float and ebb away and soon you are surrounded with feelings of love. The sweet scent of exotic woods with sensual flowers is unparalleled. 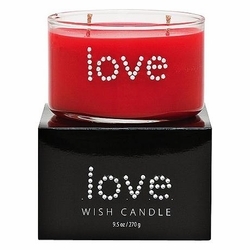 The word "love" is hand-jeweled across the clear glass of this red hand-poured double wick candle. • Exotic Woods with sensual flowers scent. • Beautifully hand-jeweled accent that will fill your space with a sparkling expression and a warm glow. • Measures 4 1/4" wide, 3" high.